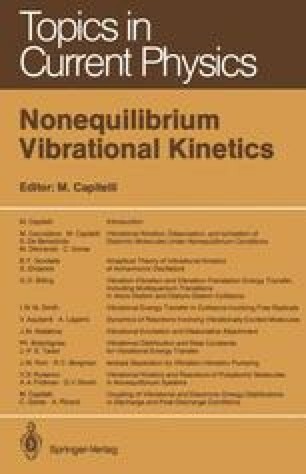 The intense progress in plasmachemistry, laser chemistry, and other branches of nonequilibrium chemistry has attracted significant attention to investigations of the vibrational kinetics and chemical reactions of polyatomic molecules [10.1–4]. However, the level of understanding of the kinetics of relaxation processes for polyatomic molecules is still noticeably lower than for diatomic ones [10.5,6]. Detailed description of the kinetics of highly excited states of polyatomic molecules meets with obstacles due to the strong interaction of various types of oscillations, which, leads both to complication of the energy level spectrum and to difficulties in calculating transition probabilities [10.6–8].